Barrier Tape- Campbell International Specialist Tapes. Technical Specification: 100% biodegradable flagging tape, Non-plastic, non-adhesive marking tape available in 4 vibrant colours, red, orange, blue, yellow. Ideal for marking & cordoning, especially in forestry and protected areas.Dimensions: 25mm x 33m Colours: Red (Pack of 12 ro..
Technical Specification: Used by Surveyor's, builders, village fetes, car rally events, queue organising, route marking, colour-coded identification, decoration, survey lines.Dimensions: 27mm x 50m Colours: Orange (Pack of 1 roll)Dark Blue (Pack of 12 rolls)Light Blue&n.. Description: Non adhesive polythene barrier tape. 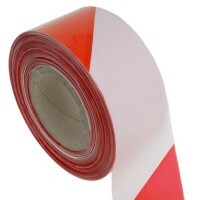 Size: 75mm x 500m Colour: Red/White Available thicknesses: 15 micron - everyday 25 micron - strong 40 micron - extra strong .. Please Contact us for prices. Identifies fire fighting equipment, first aid, fire exits, long vehicles, dangerous and no-go areas. Sizes: 25mm x 45m - Box of 4850mm x 45m - Box of 24	75mm x 45m - Box of 16	Colours:Red/WhiteBlack/Yellow .. Description: Non adhesive polythene barrier tape. Size: 75mm x 500m Colour: Yellow/Black Available thicknesses: 15 micron - everyday 25 micron - strong 40 micron - extra strong ..